WordPress Splitscreen is a bold and different way for WordPress sites to display image ads, promote content, or welcome web visitors. 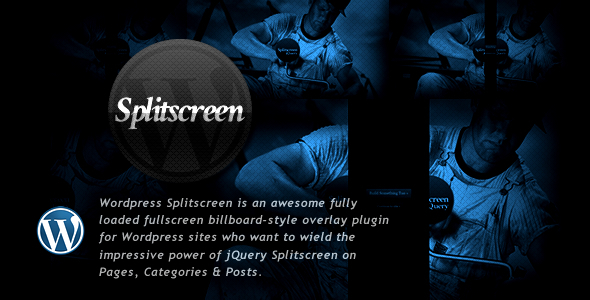 Splitscreen remains an unique, interactive, fullscreen, billboard style, overlay plugin with three valuable modes: splash, promo and teaser. Mobile & touch ready, WordPress Splitscreen transforms the core jQuery Splitscreen plugin into a powerful Wordpress plugin. Assign a Splitscreen to any page, category archive, post, posts within a category or shortcode enabled area in a WordPress site, including text widgets. Your SEO is not affected! In Splash mode, Splitscreen appears above your website content and is dismissed (closed) by clicking on the center of the page. In Promo mode, Splitscreen appears above your website content with two buttons behind the split. One button leads to a custom URL, while the other dismisses (closes) Splitscreen, allowing the user to view the current page. CSS overflow-mobile-workaround: added call to slimscroll.js and init-slimscroll.js to core.php on line 409 and 410 to allow for scrolling if content overflow.